1. You will need to firstly prepare the rice for this recipe. You can follow the Japanese rice making recipe here on the blog. Just remember, we don’t need sushi rice here, just plain boiled rice. While you rice is cooking, you can prepare the rest of your omurice ingredients. 2. Slice up the chicken and vegetables into small pieces and begin by cooking the chicken first in a small amount of oil in a pan. Once the chicken is cooked through, add the vegetables and sauté them until soft. 3. When the vegetables have finished cooking, add the cooked rice to the pan and mix well together, adding a little salt and pepper for extra flavour. 4. Stir fry the ingredients together for a few minutes, then turn off the heat, add a bit of tomato ketchup to the pan and mix it in with the rice and vegetables. 5. Set your rice aside for the moment and heat up another pan for your omelette. Beat three or four eggs in a bowl and start cooking them in a pan by making a large, thin omelette. 6. When the omelette is nearly finished cooking, pile the rice on top of it and fold one side of the omelette over the rice to complete your omurice. 7. 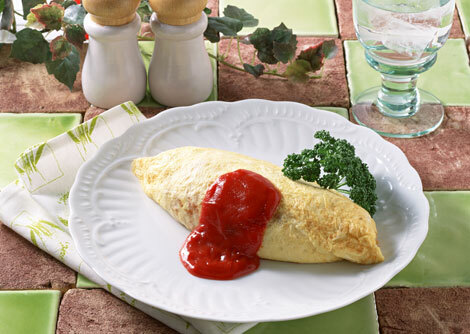 Serve your omurice on a plate with loads of tomato ketchup for a great tasting meal which is perfect for a quick lunch. – Omurice can be made with any additional ingredients that you like. Although traditionally made with chicken flavoured fried rice, you can use pork or prawn rice, or even without meat for a vegetarian option. – Another variation of this recipe is called omusoba. Rather obvious due to the name, this version uses fried yakisoba noodles instead of rice as a filling. – A good tip for making the rice used in omurice, and indeed any other fried rice dish is to use leftover rice that has been stored in the refrigerator. This type of rice becomes less sticky than freshly boiled rice making it suitable for frying and good for soaking up lots of flavours. – If you are making omurice for someone, it is common to decorate the top of it using the ketchup by drawing patterns of writing something fun. Posted in Food and tagged rice. Bookmark the permalink.